There's a lot of love for mini-ITX, and our next review is the ASRock Z370 Gaming-ITX/ac. This gaming-centric board offers users a number of features which make it highly competitive in the small-form-factor overclocking space at $180. Despite the small size, the board includes Thunderbolt 3, HDMI 2.0, Intel-based Wi-Fi and LAN, USB 3.1 support, M.2 storage, and six SATA ports - a rarety on a small motherboard. If everything else goes right, it could be a good contender for a sharp build. 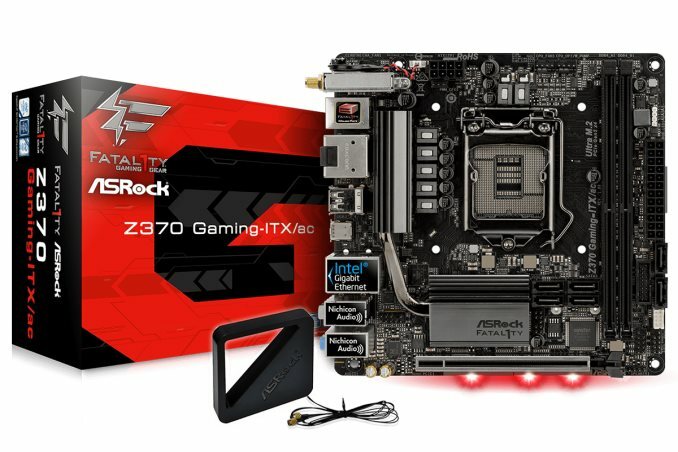 We've looked at a number of small form factor motherboards of late, and this one from ASRock is firmly in the 'Gaming' pile. The board comes with a single full-length PCIe slot which is reinforced to better support heavier video cards, but it also supports bifurcation using a riser card to extend one x16 slot to two x8 slots (no other Z370 based Mini-ITX board is able to do this). ASRock seems to have built the board with expansion in mind, with Thunderbolt 3 also featuring on the build through Intel's Alpine Ridge controller, which means it also supports USB 3.1, Displayport over Type-C, and Power Delivery 2.0 up to 36W. The 7-phase power delivery is capable of handling any current Coffee Lake CPUs on the market, both at stock speeds and overclocked without breaking a sweat according to our testing. As always with ASRock boards, DRAM support is high, and this board and can support 2x16 GB of memory, and is rated up to DDR4-4333. The high-end Realtek ALC1220 audio codec is bolstered with Nichicon Audio caps and a Texas Instruments NE5532 OpAmp for the front panel. Storage capabilities on the SATA front shouldn't be an issue with the board making room for all six ports native to the Z370 chipset. The board also includes a single M.2 slot for highspeed storage. ASRock also adds a bit of flare to the board with three RGB LEDs located below the PCIe slot on the back of the board. In all, not too much is missing compared to its full-size counterparts and is a well-appointed motherboard. Overall performance in the ASRock Z370 Gaming-ITX/ac was good landing on the middle of most of our tests compared to other 300-series motherboards. The small board excelled in power use, particularly on load, where it was used the least amount of power of all Z370 series boards. The board also takes the crown of the fastest board to boot taking less than 18 seconds to get through POST before the OS drive takes over and loads Windows. We saw above average results in both 7-Zip and 3D Particle Movement testing with the board using its Multi-Core Enhancement (enabled by default) to stretch its legs a bit, running these tests at 4.7 GHz and 4.4 GHz cache. Overall, a very good showing in the performance and power metrics. Our overclocking results worked out as expected and topped out at our 5.1 GHz clock speed. Any more than that and we have really breached the 90C threshold we set for ourselves. The Gaming-ITX/ac was the first board we have tested to show a fair amount of vdroop so those who prefer to see load voltage close to what was set in the BIOS, will have to set Load Line Calibration to Level 1. Also, once we hit the 5 GHz mark, we started to see power limit throttling during testing. A quick adjustment of that option in the BIOS and that behavior was eliminated. Auto overclocking through the EZ Mode yielded a 4.5 GHz all core result with a -2 AVX offset. Overall the board handled what we could throw at it with little fanfare, just how most enthusiasts like it. The ASRock Z370 Gaming-ITX/ac is currently priced at $180 on Amazon.com. This price point puts it square in the crosshairs of the MSI Z370I Gaming Pro Carbon AC at $170, the ASUS ROG Strix Z370-I gaming at $202, as well as the slightly lower priced GIGABYTE Z370N WIFI at $150. The biggest difference between the boards will come from SATA ports (this has six, the other boards listed run with four), M.2 slot count (the GIGABYTE and ASUS offerings have two, this only has one), as well as video outputs. 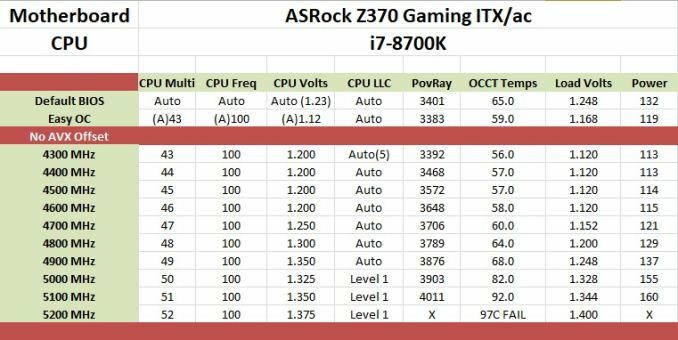 The ASRock Z370 Gaming-ITX/ac is the only board of those listed with Thunderbolt 3, which for TB3 users is a big value-add, and also has HDMI 2.0 support. ASRock has almost a dozen motherboards in their Z370 stable, covering motherboards of all sizes and price brackets. 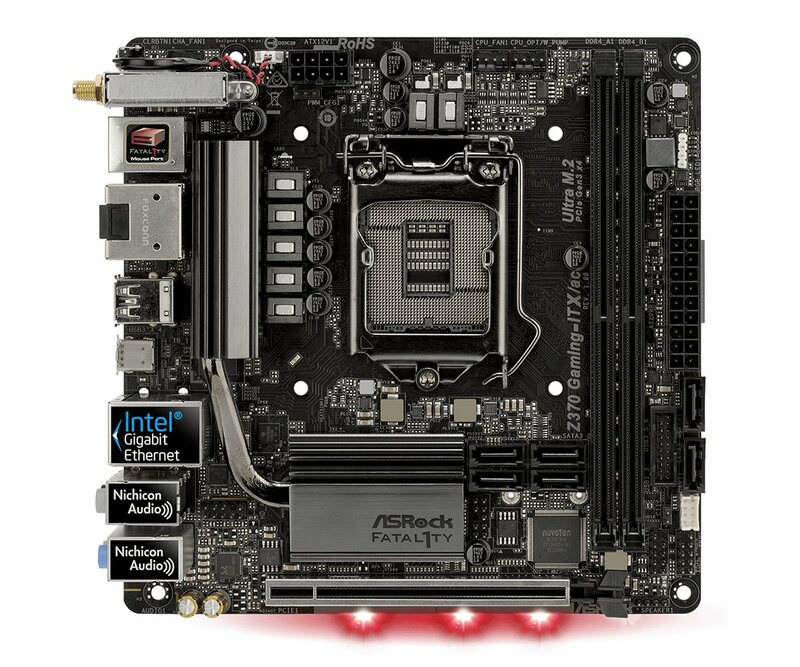 At entry level into the platform, ASRock offers their Z370M Pro4 MicroATX board starting at $110. The flagship board in the mainstream platform is the Professional Gaming i7 coming it at $287+. Between those are two Mini-ITX boards, with the rest being ATX, all offering different feature sets and aesthetics. One important piece of information to note: technically these processors use the LGA1151 socket, also used by 6th and 7th Generation processors using the Z170 and Z270 chipsets. But due to several (albeit minor) difference in the pin-layout of these two sets of processors, the 8th Generation Coffee Lake will only work in Z370 boards and are not cross-compatible. 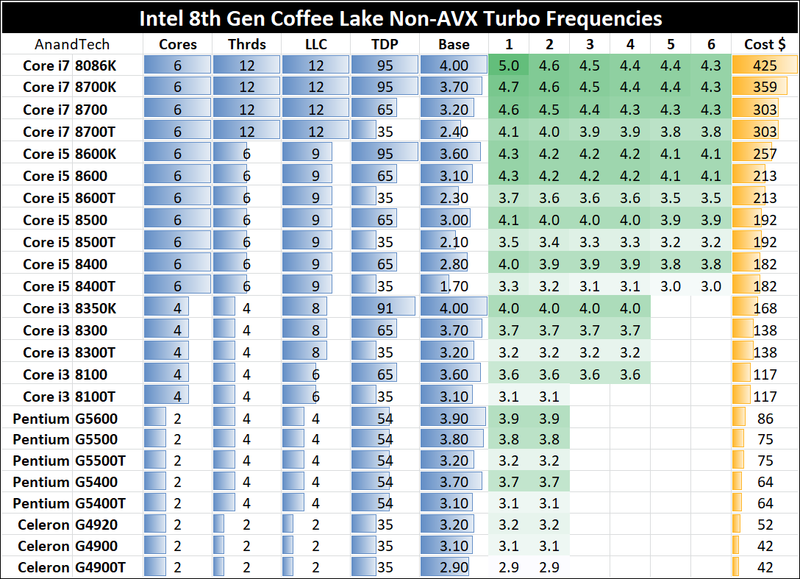 Back in October 2017, Ian Cutress reviewed a couple of processors (i7-8700K and i5-8400) in the Coffee Lake lineup - details on the rest of the product stack are listed below. Doesn't it hang off the DMI3 anyway? So it shares 4xPCIe 3.0 bandwidth with every other I/O on the board except the graphics card? As in, roughly 32Gb/s for everything? Kudos to ASRock and their plethora of features. However, it is missing a USB 3.1 header, those should be standard now. Does the BIOS support enabling SGX? Is this motherboard capable of playing UHD Blu-ray? "... Cutress reviewed a couple of processors (i7-8700K and i7-8400) ..." -- i5-8400.